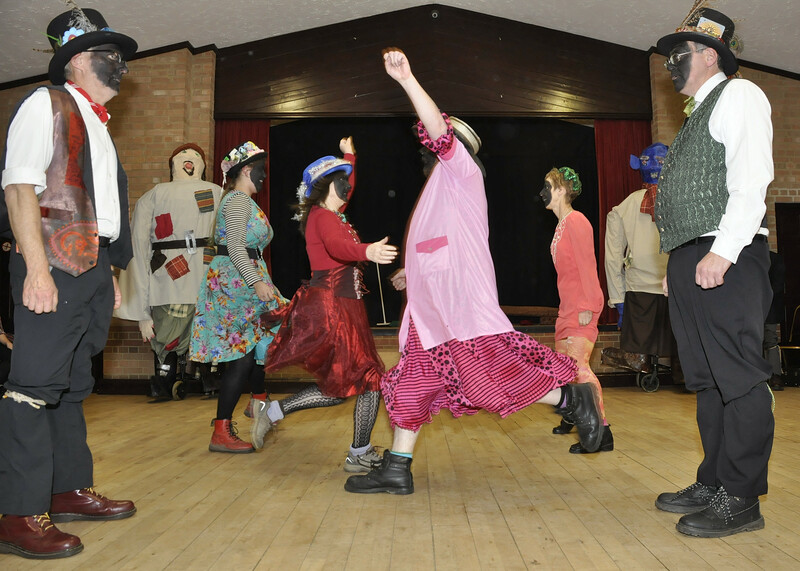 Although some of our very earliest dances were adapted from existing molly and morris dances, most of our dances have been inspired by the rich store of myths, legends and folk-tales to be found in the Fens of East Anglia. Old or new, our dances remain firmly rooted in tradition. A hair-raising tale of murder, theft and retribution, Black Sheet tells the gruesome story of two prisoners of war who attempted to escape from the back-breaking task of draining the fens. Based on a tale told by the king of Fenland story-tellers, Walter Barrett, this dance tells how a lowly publican guided a mysterious traveller to safety and later reaped the rewards. The marsh-spirit, Tiddy Mun, angered by attempts to drain the Fens, wreaked revenge on the perpetrators and was only placated after villagers met at the time of the new moon to appease him by pouring water back into the dykes. A giant of a man, Tom Hickathrift gained such renown for his prodigious feats of strength, carrying tree trunks, drawing carts loaded with beer and – best of all – slaying ogres that he was honoured with a knighthood. Sir Thomas now lies buried in the churchyard at Tilney All Saints. Inspired by a song written by the children of Mepal and Witcham Primary School with the help of one of our musicians, Nicky Stockman, Fen Tigers celebrates the uniqueness of Fenland landscape and the totemic significance of the grey goose feather. Dancing College Hornpipe at Tilney St Lawrence school, Nov 2015, watched by a bemused Tom Hickathrift. Originally danced in the village of Girton – home of one of the Cambridge University colleges – this is one of the Comberton Feast dances which Gordon Phillips learned from Cyril Papworth in 1981. Our adaption of one of another of the Comberton Feast dances which Gordon Phillips learned from Cyril Papworth. “There’s a long, long trail a-winding into the land of my dreams,” Soldiers in the Great War found the words of this song, composed in happier times, perfectly expressed their feelings of loneliness and yearning for home and loved ones. Performed to a lone voice, accompanied only by the stamping of the dancers’ feet, this is one of our most memorable dances. First performed by Ouse Washes on the hill outside Cassel, in Flanders, this dance was composed to commemorate the debacle of Frederick, Duke of York who famously marched his men “neither up nor down.” Danced to the tune of “The Unfortunate Tailor”, at some point the dance took a nautical turn and now celebrates Norfolk’s most famous son, Horatio Nelson. Strange is our trademark dance and the one from which everything else flowed. The second dance we created, after Mississippi, it had the elements of surprise, movements with power and controlled wildness, a fantastic and unexpected tune, movements that went out and others that contracted and a brilliant finish. We’ve been trying hard to come up with something as good ever since.